Soldiers from the hospital about to go off on an errand or shopping in ‘the big trap’ drawn by Tommy the horse. 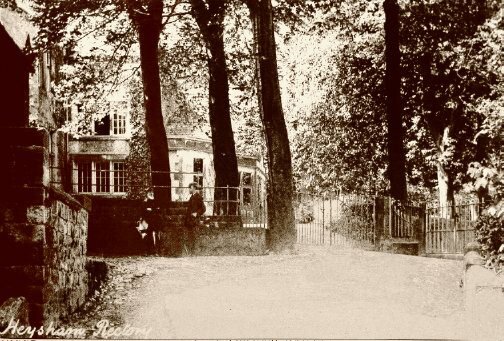 In the image below of the old rectory entrance (4 beech trees) you can see where the horse and cart would have been waiting. 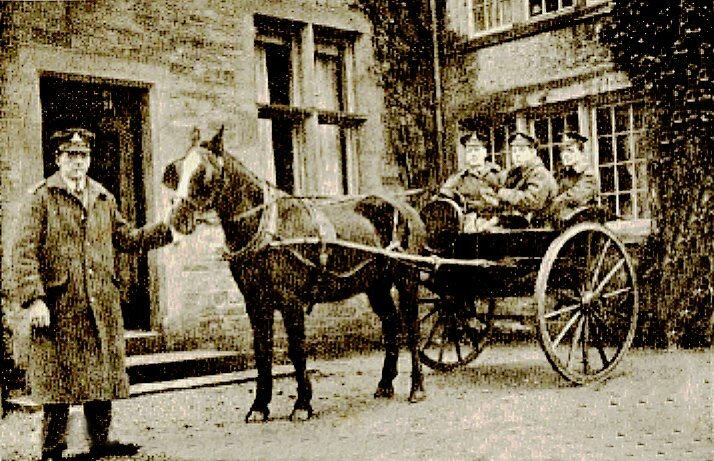 On the right of this early 20th century photograph is the 1860 Rectory after refurbishment by the first of the ‘Royds Rectors’ John Royds. This building was demolished about 1960 and replaced by the present modern building standing further back to the south. The building behind the four beech trees (now 3) was the rectory stables, now St Peter’s Church Hall. The first rectory on the same site was, according to local historian Eileen Dent, built by William Bushell, Rector in the early 18th century. Prior to this date it is generally accepted that Greese Cottage was the rectory. It is sometimes referred to as The Old Rectory. On the 1838 Tithe Map one can see several buildings on the site. ‘According to the 1917 Christmas edition of Heysham’s ‘Hospital Gazette and Calendar’ the hospital opened in the Spring of 1915 with 10 beds, which soon increased to 15 at the request of the authorities. Dr Herd provided the necessary medical attention “with skill and unfailing kindness”, while a regular nursing staff took care of the patients’ general welfare. Assisting the regular staff were many local people who offered their services voluntarily, resulting in the patients being outnumbered by those who were attending to their needs. Soldiers who were able would lend a hand inside the hospital or around the grounds, gathering fruit or tending to the rectory ponies, while some would go off on shopping expeditions or run errands in ‘the big trap’ drawn by Tommy the horse. If you wish to read the full extract click here. An original of the Hospital Gazette is available on the website of Lancaster Military Heritage Group. Unfortunately this has almost illegible text and many of the images are faint or damaged. To the left is an enhanced version of one which is in good condition and, in the image beneath it, it is possible to identify where at the Rectory it was taken. Below and below left are further images from the Gazett. ‘Welcome visitors to the nursery’. Presumably the two boys are the Rector’s sons. ‘”Get plenty!” Orderlies off to gather fruit’. 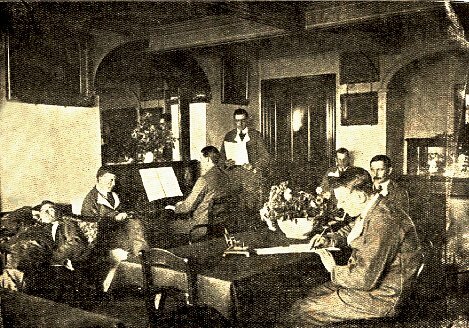 ‘During the first World War (1914-1918) Carr Garth was used as a convalescent home for officers. It was offered for this purpose by the then owner, a Miss Smith in l915, who said that it had to be used as a Convalescent Home for our brave troops for the duration of the war. Carr Garth is a listed building (now a private residence) at the junction of Bailey Lane and Knowlys Road. The beech trees at the gate of the old rectory seen in both the rectory images above are estimated to have been planted in about 1803. One was felled in December 2007 on the grounds of perceived danger to buildings and the public. Subsequently a section of it was the subject of an extensive analysis by the national Arboricultural Advice and Information Service in Surrey who are currently investigating what tree rings can show about the history of individual trees and also the development of decay in old trees.Their estimate for the age of the felled tree was 204 years.. For the full report click here.